Welcome to Country goes beyond other Australian travel guides; it’s also an introduction to Aboriginal and Torres Strait Islander people, culture and places of interest. Its author, Marcia Langton, is a well-known academic, commentator and author. A descendant of the Yiman and Bidjara people, Langton has been an important voice in Australia since the Aboriginal rights movement of the 1970s. In this book, Langton takes readers off the beaten track, to places rarely seen by tourists. The first part of the book covers topics including history, languages, kinship, art, performance, literature and more. The second part provides a guide to places, landmarks, experiences, cultural festivals and food, grouped by the different states and territories. There is even a section on how to seek Indigenous-run businesses, support ethical tourism, and what to expect while on Country. 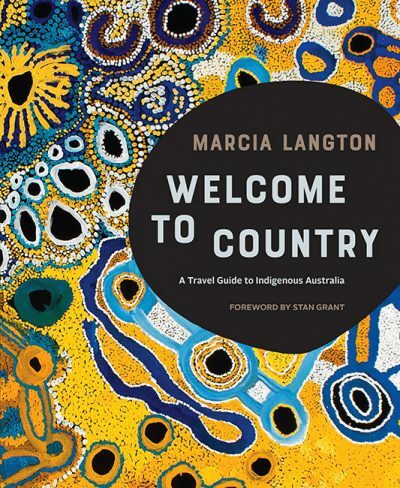 Certain sections of Welcome to Country are similar to Bruce Pascoe’s popular 2008 resource, The Little Red Yellow Black Book: An Introduction to Indigenous Australia, and the rest is rich in travel tips in the style of a Lonely Planet guide. This book will appeal to a broad readership. Its compact size is perfect for travellers and the easy-to-digest information will be sought after by schools, libraries and readers who want to know more about Indigenous people in Australia.